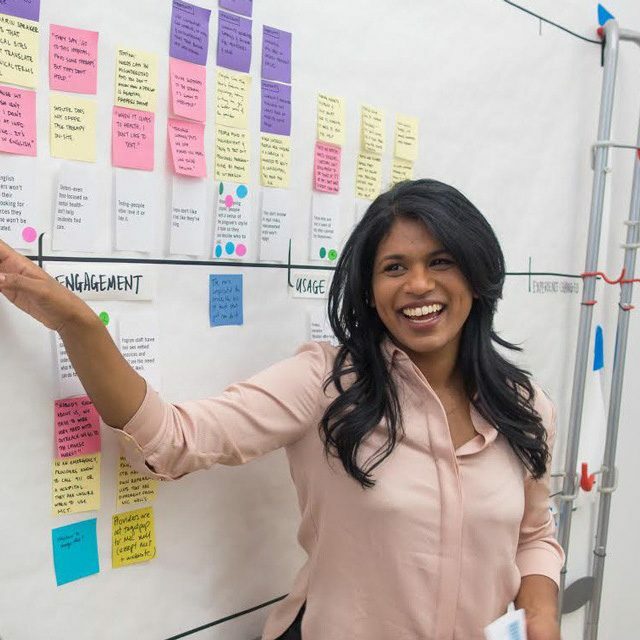 Shanti Mathew (MDes 2016) is Strategy Director of The Public Policy Lab (PPL), a New York City based nonprofit that focuses on serving the needs of low-income and at-risk communities. Using design and human centered methodology, she aims to reframe the conversation around public services, bringing the lived experience of the public and front-line staff into policy and program design. PPL bridges the gap between policymakers and the individuals most affected by it. With a background in the social sciences and the nonprofit sector, Mathew discovered the world of design strategy when she began working as a researcher at a product design consultancy in 2013. She decided to attend IIT Institute of Design and asked herself, “How do I use this amazing opportunity to lean into the things I’m curious about, and explore that in a low risk environment?” Mathew knew she was interested in designing for social good, and through ID courses and personal experimentation, eventually found policy making. Mathew was the first recipient of the Public Management certificate created in partnership with the Stuart School of Business. “I had to learn about the landscape of government and public policy to decide where I wanted to be in that ecosystem,” she said. So Mathew worked with the school to develop a program that suited her needs. As a student, Mathew also helped create BarnRaise, a student-run collaborative maker-conference in which private and non-private sector groups and individuals work together to prototype solutions to problems posed by community organizations. The most recent Chicago BarnRaise addressed food waste reduction as a pathway to a more sustainable future for Chicago’s food system. The model has been replicated throughout the U.S. and in Canada. “Often times our systems are structured so that the people who need them the most have the hardest time accessing them,” said Mathew. Her work now centers on making these systems more just, and redistributing power across multiple populations. On a typical day, Mathew is helping run the organizational machine at PPL—going back and forth between project management, sending proposals, and business development. At the PPL, Mathew has led work with the U.S. Department of Veterans Affairs, the New York City Department of Education, and the Mental Health Association of New York City, among other public-interest agencies. Her work with the New York City Department of Education (DOE) sought to tackle poverty through public schools. More than one quarter of New York City children live in poverty which leads to lowered quality of life in many ways, including in their educational outcomes. NYC Community Schools strive to help children thrive by integrating social services into the fabric of schools themselves. Partnering with Single Stop, a national benefits-access organization, the PPL set out to discover if school staff could connect families to public benefits in ways that felt safe and intuitive. The answer seems to be ‘yes.’ PPL asked school staff to do outreach and connect families to expert benefits enrollment counselors using a set of supporting communications and digital tools. In a short trial period, school staff were able to successfully refer 17% of interested families to an enrollment specialist. The DOE and PPL are currently working on a phase 2 of the project to pilot the program in a larger set of schools in order to develop a fully-tested model which can be rolled out across all 227 Community Schools and beyond.